I had the need to test the saturation current of some inductors I had wound. 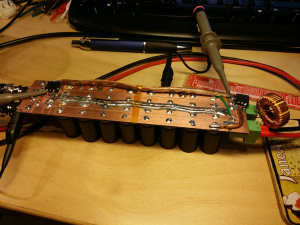 I built this pretty simple tester for testing the saturation current of inductors. It seems to work pretty well up to about 100A or so. 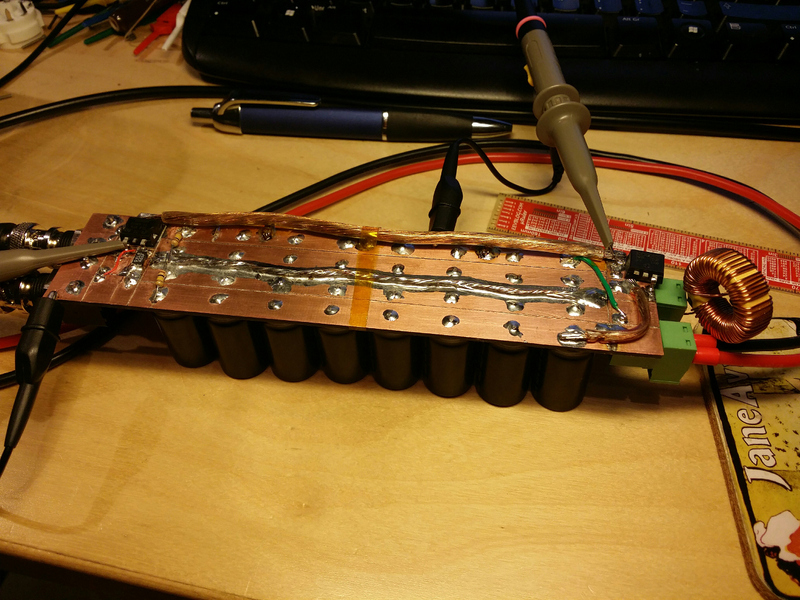 I had a switch-mode power supply (48V to some lower voltages at around a kW or so, from telecommunications equipment) laying around that had a lot of components (FETs, power diodes, electrolytic caps and shunts) I needed so I desoldered it and turned it into this tester. 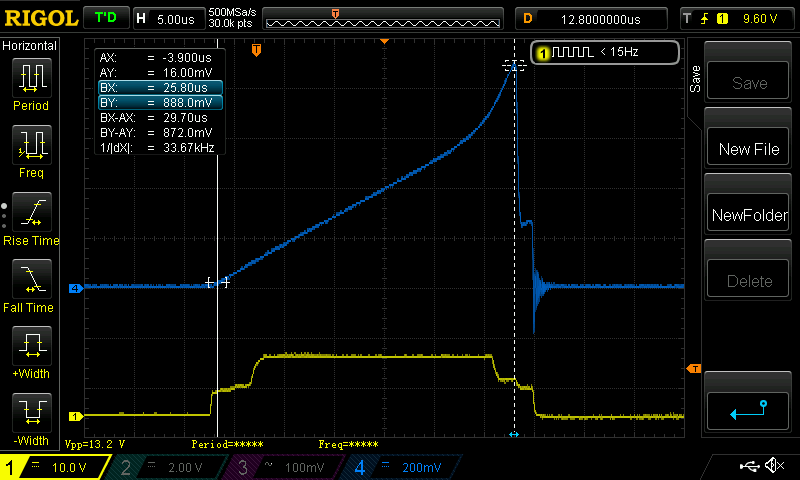 From this scope shot you can clearly see that the inductor starts to saturate at around 600 mV which corresponds to about 24 A (25 mV/A). The time derivative of the current waveform is inversely proportional to the inductance of the inductor so you can also calculate the inductance of inductor at some known current level. What this means is that as the current starts rising faster and faster (=the slope of the waveform gets steeper) the inductance of the inductor is dropping. There is no simple answer when the inductor is saturated, you basically just have to decide the amount of inductance drop you can tolerate in your application. I would have shown the derivative of the current waveform on the scope shot but my Rigol DS1074Z seems to have pretty buggy math-functions and it did not seem to work. 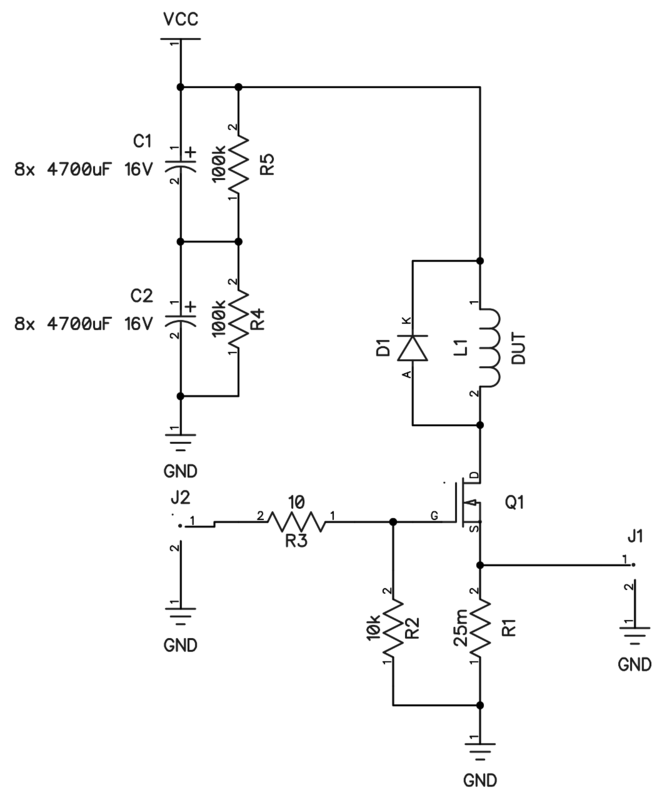 The diode in anti-parallel with the inductor is also important. 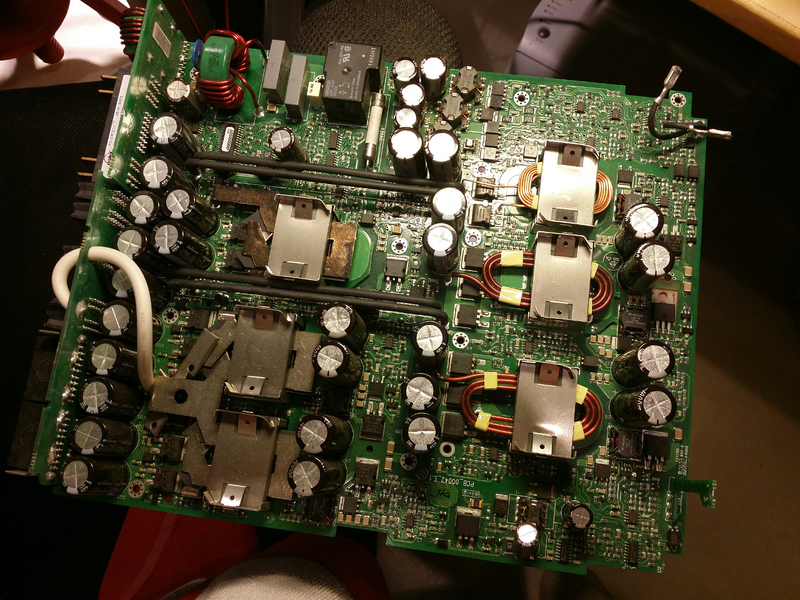 Without the diode you would have a massive voltage spike over the FET when it switches off because the current would have nowhere to go. I used a half of a 30CTQ060S double schottky-diode. I’m using my Hantek HDG2002B signal generator to drive (attached to J2) the FET. 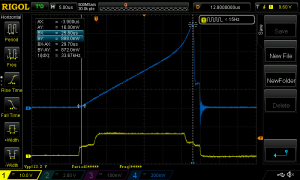 The FET gate drive waveform is not the most optimal (large plateaus due to miller capacitance) because of the limited drive capacity of the signal gen but it seems to work. 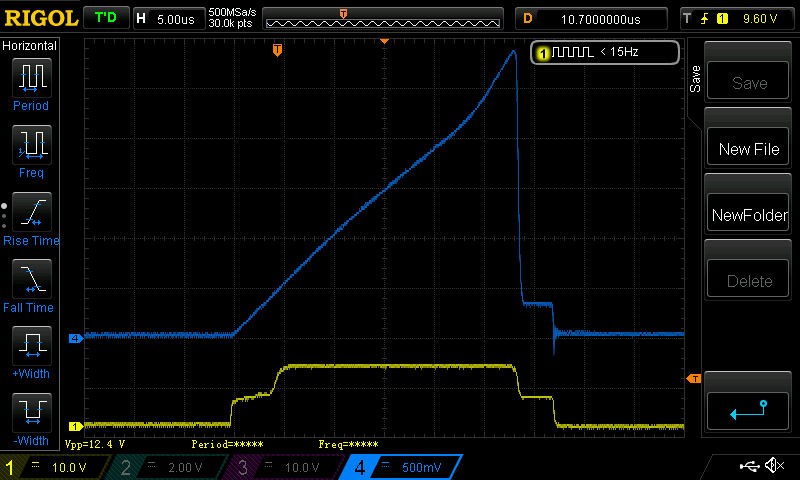 I’m using the pulse mode with a 10 ms period and pulsewidth of 5-100 µs or so depending on the inductor. 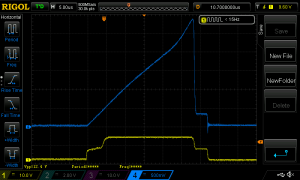 The repetition rate could or should be lower than the 100 Hz I’m using (the make sure the current decays properly between pulses) but this Hantek signal gen does not seem to work properly with periods longer than 10 ms for pulse mode… You can also control the “rate of saturation” by adjusting the voltage over the inductor. 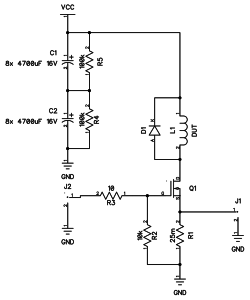 I have the thing connected to a lab PSU from where I can vary the voltage between 0 and 30 V.
If I’d want to make this circuit better I would swap my 45 mOhm RDS FET (STB40NS15) to something with a lower RDS and change my shunt to a smaller resistance as well. Thanks for the project idea to jahonen! Cool stuff, but the reservoir caps are not ideally mounted. You should minimize the surface between poles + and – so the idea is to use a double sided board, one side is positive, the other side is negative. You will reduce the parasitic inductance, and increase the di/dt . 1000uF per amp is nice. Hey, I built one too, years ago. Pretty handy. Not sure what you needed so much capacitance for, I built mine with a single one — its ESR was much less than the shunt I used, so it was just fine up to 80A or so.